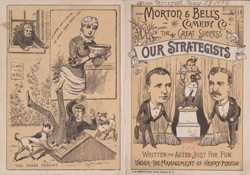 This leaflet is advertising a performance by Morton and Bell, stage comedians appearing in the mid to late 19th century. Going to the theatre to see performances by acrobats, comedians, dancers and vocalists was a very popular form of entertainment during the late 19th century, especially for the wealthy who could afford to travel in style and dress in their finest clothing. The standard of acting at this time was generally poor and so instead it was the variety theatre that was popular, dancers, acrobats and comedians were in great demand.